An extract called Garum Armoricum® from the fish Molva dypterygia, found in deep waters off the Armorican peninsula of Brittany. It was used by the ancient Celts of Armorica, Ireland, and by the ancient Romans, as a food supplement to improve resilience to physical and emotional stress. * Research confirms that Stabilium® 200 may be useful for coping with stresses from work or personal life, and can support healthy sleep patterns, energy, memory, and mood. An extract called Garum Armoricum used by the ancient Celts (third century BC) of Armorica, Ireland, as a food supplement to improve resilience to physical and emotional stress. It was also used for the same purpose by the Roman Empire, for women, children, and the elderly, and to prepare the Legionnaires for long marches into battle. Garum Armoricum is created from the fish Molva dypterygia, found in deep waters off the Armorican peninsula of Brittany. This blue fish has long been a prized catch; even its physical appearance is extraordinary, with enormous eyes and distinctive blue colour. It lives at depths of 1500 to 3000 feet. Because of the oxygen deficiency and the great hyperbaric pressure at those depths, the fish developed a special metabolism and physiology, endowed with body chemistry to handle the stress of those conditions. 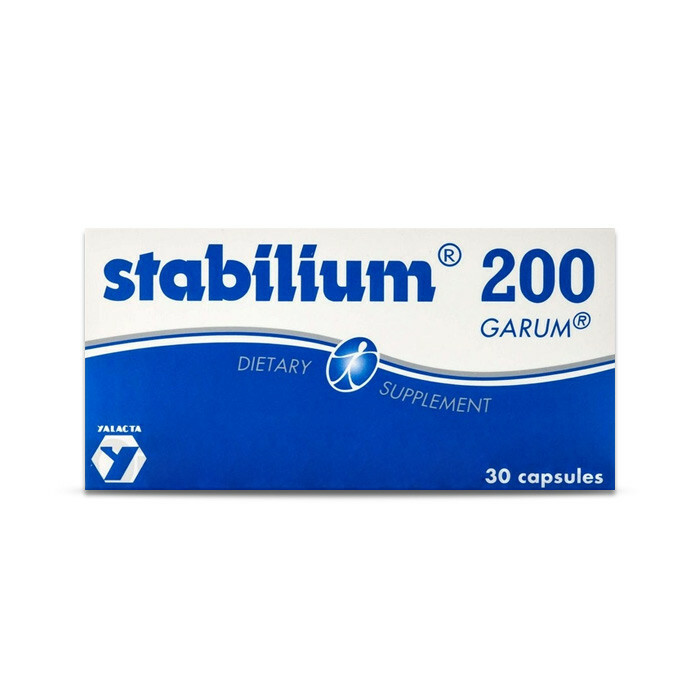 It is thought that ingesting the extract in Stabilium® 200 complex supports the body during modern stressful conditions, both mental and physical, just as it did in ancient times. Research confirms that Stabilium® 200 may be useful for coping with stresses from work or personal life, and can support healthy sleep patterns, energy, memory and mood. Why take an ancient fish remedy to support stress? This remedy is possibly the oldest nutritional supplement in Western Europe, being over 2,000 years old. It has stood the test of time, and has been the subject of 20th century clinical research which showed benefits. Modern life consistently provides a multiplicity of sources of stress on the human body and this supplement is but one that could help to provide some counterpoint by supporting resistance to stress. As a dietary supplement, four (4) capsules daily, taken with water preferably on an empty stomach. For best results continue use for 15 days, thereafter 2 or 3 capsules every other day or as desired. Ingredients: Fish gelatin, Fish Oil, Vegetable Glycerin, Shellac, Silicon Dioxide.